(Nanowerk News) Earth's magnetosphere, the region of space dominated by Earth's magnetic field, protects our planet from the harsh battering of the solar wind. Like a protective shield, the magnetosphere absorbs and deflects plasma from the solar wind which originates from the Sun. When conditions are right, beautiful dancing auroral displays are generated. But when the solar wind is most violent, extreme space weather storms can create intense radiation in the Van Allen belts and drive electrical currents which can damage terrestrial electrical power grids. Earth could then be at risk for up to trillions of dollars of damage. 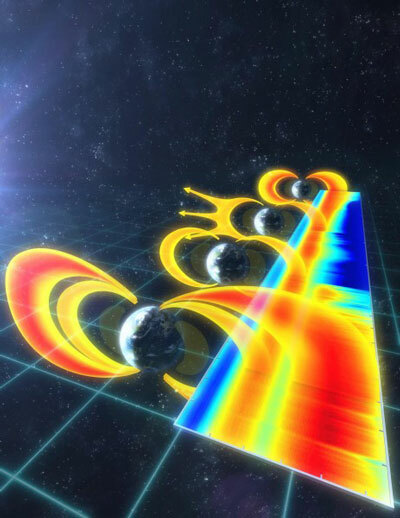 Announced today in Nature Physics ("Explaining the dynamics of the ultra-relativistic third Van Allen radiation belt"), a new discovery led by researchers at the University of Alberta shows for the first time how the puzzling third Van Allen radiation belt is created by a "space tsunami." Intense so-called ultra-low frequency (ULF) plasma waves, which are excited on the scale of the whole magnetosphere, transport the outer part of the belt radiation harmlessly into interplanetary space and create the previously unexplained feature of the third belt. "Remarkably, we observed huge plasma waves," says Ian Mann, physics professor at the University of Alberta, lead author on the study and former Canada Research Chair in Space Physics. "Rather like a space tsunami, they slosh the radiation belts around and very rapidly wash away the outer part of the belt, explaining the structure of the enigmatic third radiation belt." The research also points to the importance of these waves for reducing the space radiation threat to satellites during other space storms as well. "Space radiation poses a threat to the operation of the satellite infrastructure upon which our twenty-first century technological society relies," adds Mann. "Understanding how such radiation is energized and lost is one of the biggest challenges for space research." Mann is co-investigator on the NASA Van Allen Probes mission. One of his team's main objectives is to model the process by which plasma waves in the magnetosphere control the dynamics of the intense relativistic particles in the Van Allen belts--with one of the goals of the Van Allen Probes mission being to develop sufficient understanding to reach the point of predictability. The appearance of the third Van Allen belt, one of the first major discoveries of the Van Allen Probes era, had continued to puzzle scientists with ever increasingly complex explanation models being developed. However, the explanation announced today shows that once the effects of these huge ULF waves are included, everything falls into place. "We have discovered a very elegant explanation for the dynamics of the third belt," says Mann. "Our results show a remarkable simplicity in belt response once the dominant processes are accurately specified."